Change is all around this time of year, whether it’s in the way the air crisps each morning and evening, or the way the trees undress. Frost and falling leaves become excuses for cuddling indoors, probably beneath our favorite blankets. But it is also a harbinger of some serious weather — and some necessary maintenance if we consider commercial property. Temperamental fall temperatures can lead to massive swings in the mercury, hail storms, freezing rain, freak snow storms and general uncertainty. 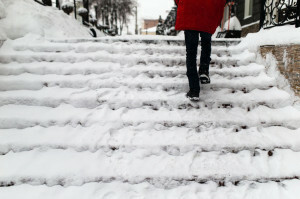 In the short term, that can create slippery sidewalks and entryways outside a business or near delivery ramps. Even without visible ice, the freeze and thaw cycle can turn these areas into ice rinks. Fortunately, there are products and methods to keep walks safe and dry. For commercial property owners, this is crucial given any risk of liability prompted by an injury. The same risks will be compounded over the coming weeks and months as snow is certain to blanket the forecast. Big storms can quickly cause headaches for commercial buildings that are unprepared. Service areas and delivery spots can be rendered impassable without prompt snow removal service, crippling business. On the other end of the spectrum, general entry points and public rights-of-way must be completely cleared of snow. The operation of any building depends on access to it. So even though winter may still seem on the horizon, wouldn’t you rest easier knowing all of your slip and snow concerns are under control? This is only one facet of our comprehensive building maintenance portfolio. But now is the time to solve upcoming winter weather concerns.